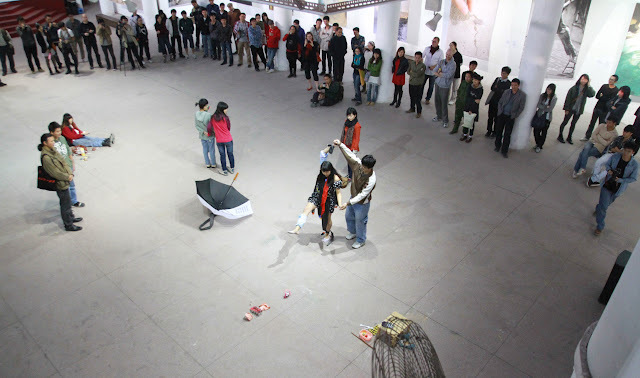 ‘Jay’s solo performance ‘Military Craft‘ was interactive and dynamic, arranging interpersonal structure, working with joy and humor, intelligently contextualizing other artworks- for example she observed “I-Ching‘ umbrella by Huang Rui from the day before her performance. 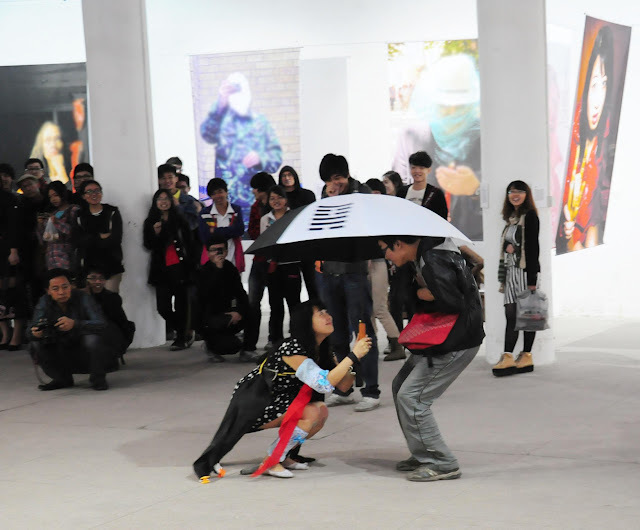 She then used the umbrella as centre focus of her performance. 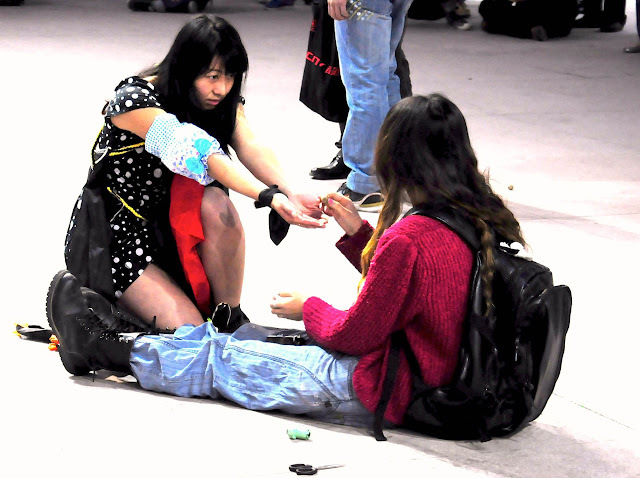 She managed to involve others in a fascinating manner, showing great empathy and connection to the audience for them to meaningfully take part in the performance on a very personal and individual scale, despite the huge audience. Following with patience all along and noticing all the fragile situations, she really seeks to to change our perspectives- and captures the essential truth of difficult political issues with this astonishingly original and characterful performance. 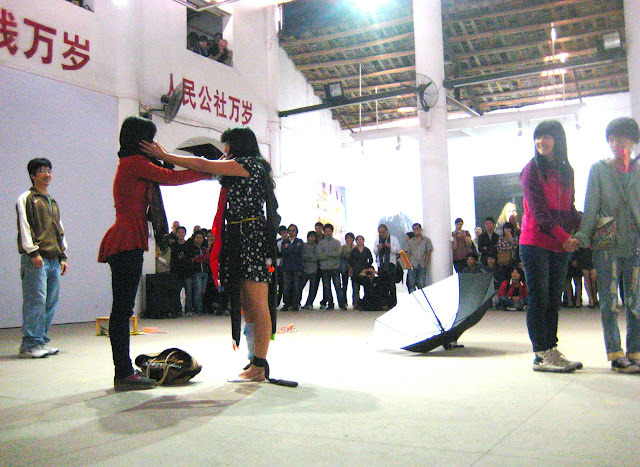 ‘Military Craft’ by Kai-Oi Jay Yung is a live performance that took place at Guangzhou Live, 2011, China. 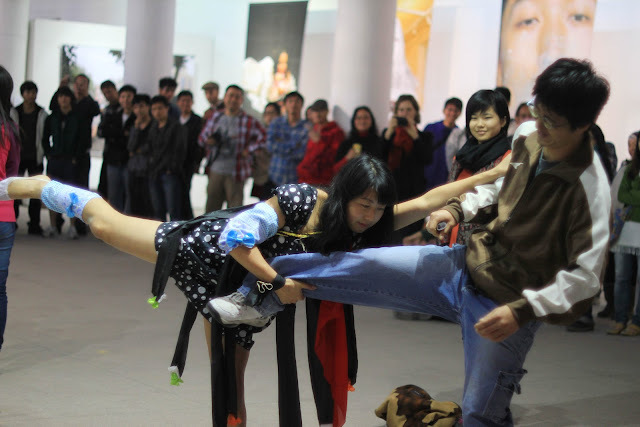 This performance was the result of a four month research trip across China, specifically time spent in the cities of Shanghai, my parent’s birthplace, Beijing and Guangzhou. 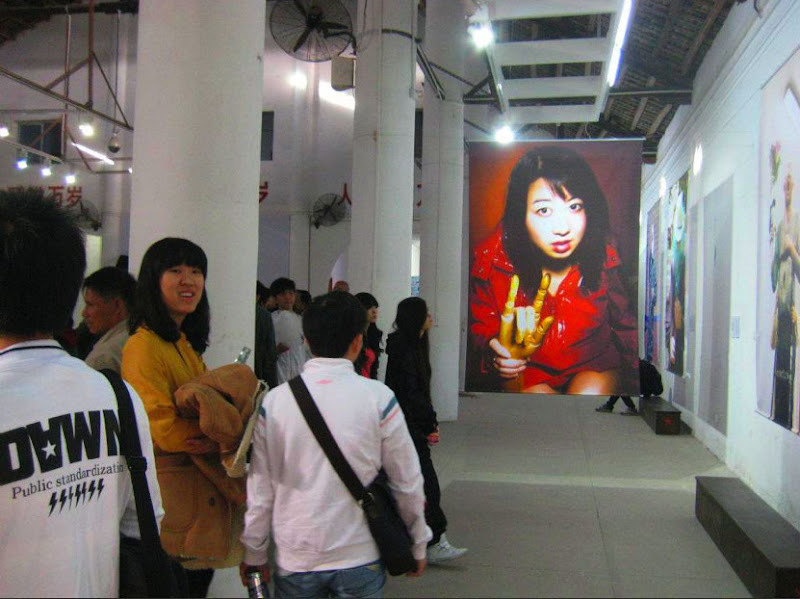 I consider such complex issues of individuality, togetherness and subordination in face of such mass population and speed of advance, pitted against China’s long and intricate social political history. I responded particularly to the overriding sense of humanity and humility I have experienced here, entwined with specific social economic problems inevitably stemming from centralisation and it’s two tier globalised system. Through my actions, I combined the force and energy of the forward marching military leader with the spirit and lightness towards the Buddhist/Taoist Seer who seeks to join others in togetherness and affection. My gestures included movement of hand, face- all parts of my body, as well as a series of objects I used to incorporate others into the actions taking place. A teacup, candles, an electronic musical spinning top, a comb, a feather kicking toy… this became instinctive tools for me to extend to others and bring them into the space. 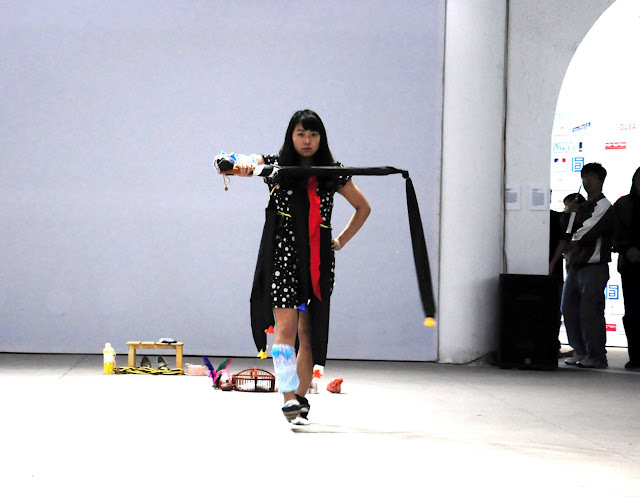 I wore a military outfit from 15 umbrella covers I sewed together donated to me by artist Huang Rai during his own performance. My flowing, ragged garment incorporated secret hiding places for biscuits and for me to store simple messages that I distributed to others as a result of chance playing and the use of certain instruments to determine my actions. A pair of oversized chopsticks became my divining device, a tailor made I-Ching umbrella became my weapon/shield for defence and I used it to catch, dictate and orchestrate humour and response/activity from others towards me. 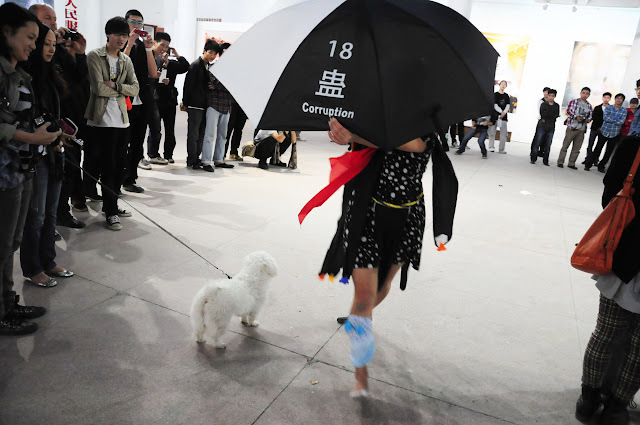 The performance became a process that ended in the effacing of the word ‘Corruption’ and its hexagrams from the book of changes printed on the umbrella. 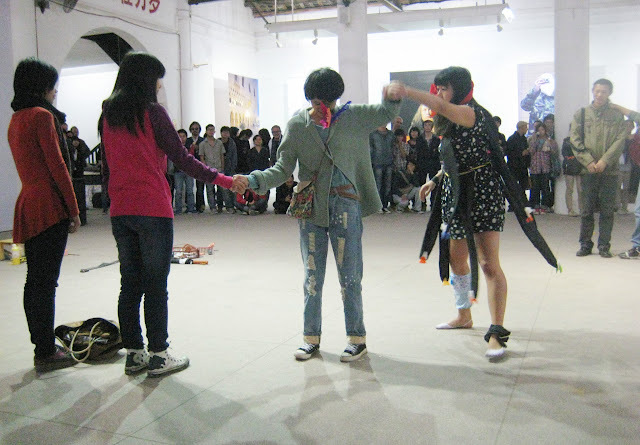 For me, the performance was a way to touch others and to prompt how we may consider issues of individuality, to enter into a different environment that allows us to interact with an alternative system of how we can be. 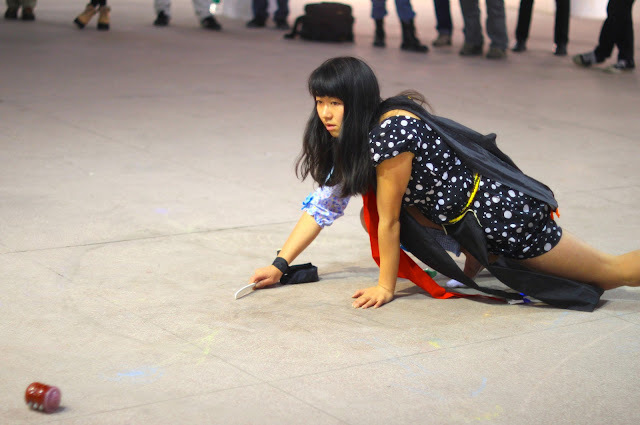 “After setting up the action space into a strangely relaxed and tense atmosphere through her props, her attire, and thoughtfully selected music, Jay Yung seizes the attention of the audience and launches them into a postural dance to the rhythm and cadance of her soundpiece. She leads them into a whirlwind which to begin with seems like to be filled with merriment. 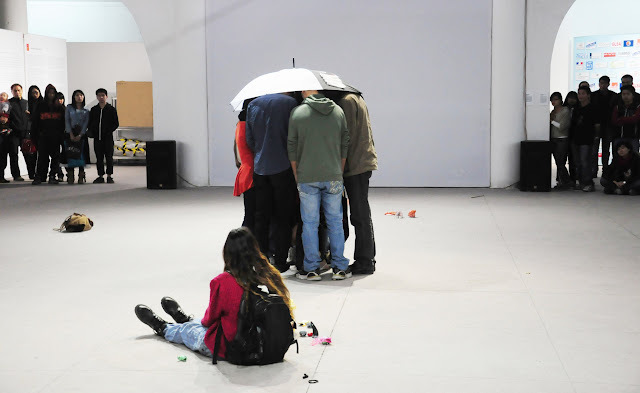 Over time, with an umbrella she invites people in an improvised dance- the music changes …. Before, the music was for entertainment but now it becomes the beat to march feet and gathers or separates the particpants. The multifunctional use of the music combined with the gesture and actions of the performer who guides and invites us to take part allows us to break through walls of appearances. “Kai-Oi Jay Yung´s performance was kind of strange to me in an inspiring and wonderful way. I saw it very important to the village we were in, as well as to China, and a mixture of funny parts combined with a very serious theme. What got me the most was use of sound, which made the visual performance all the more interesting and strong. The interaction with the audience made the performance spontaneous because no one actually would know what happens next. 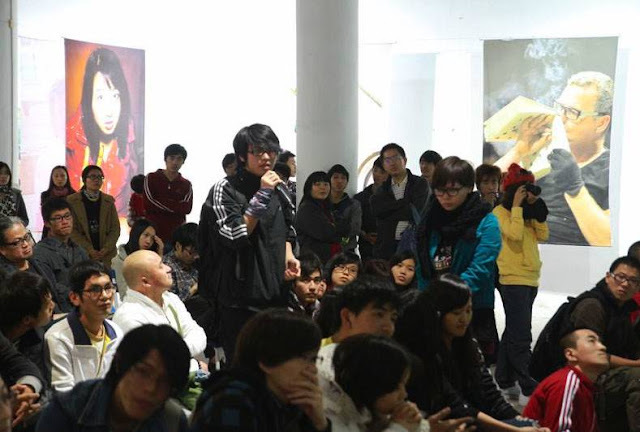 The situation in the huge space was used very cleverly though the audience was spread widely everywhere. Then you involved many more people to come into the circle, you are rather stunning in the use of props as ‘chance’ divining tools to choose people to take part…. I become so involved I forget time. I believe this is the same for everyone. You skilled in the way you read people and the control you exercise in the entire performance and of the entire exhibition site, people’s thoughts and emotions journey with the ups and downs of you and your actions, not to mention previously, I am not optimistic about the clutter of objects! Almost everyone has forgotten themeselves when you end your performance, and a burst of warm and long applause follows. My hands are beat red. I believe it is sincere applause, and after everyone was impressed by such truth expressed! This was a bold new realm of working for me in terms of live action performance and audience of such scale in a non-participatory manner. 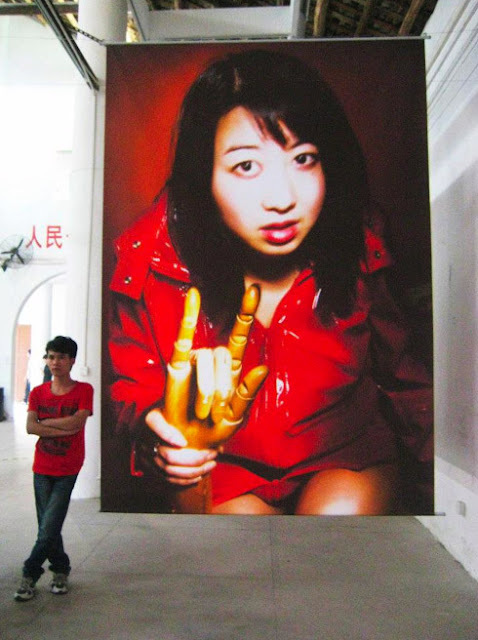 Rather than just a passive viewing experience, I wanted to stay true to my own distinctive participatory nature and consider how to devise an emotive, critical yet sensitive and touching piece that surmised my learnings of China thus far. It was important for me to present my understanding of ‘live action art’ and to successfully challenge my practice in terms of relating my process to a live audience. 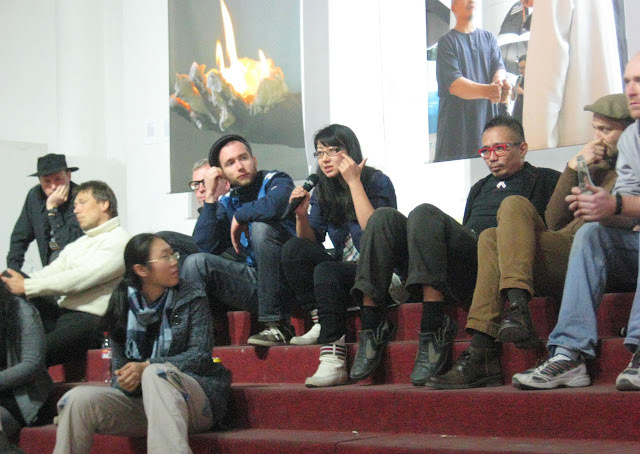 It was a chance to experiment with how I could transfer such factors associated with the white space installation- as lighting, site specificity, sound, curatorial considerations as well as social/political sensitivities to this realm of action art in an equally pertinent and effective manner. I brought to this hour long piece my own inventiveness and process, not only creating an entirely new work but also choosing to incorporate sound and respond to fellow artists works that were part of the festival to bring a degree of humour and lightness to the heavy themes I was addressing. I was also able to reach new limitations in terms of my own physical body and movement in relation to physical space. 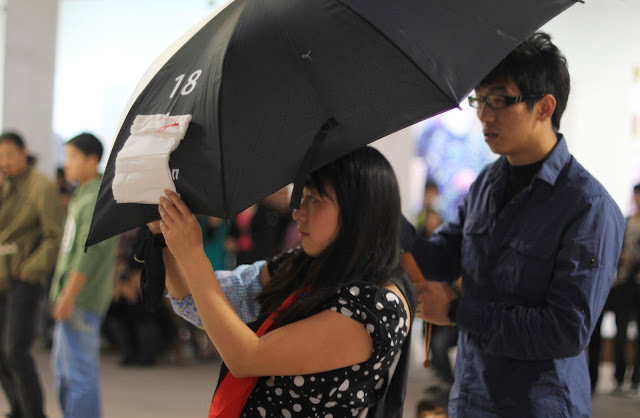 I used tools (‘props’) to strengthen audience participation- in particular, Huang Rui who gave me one his I Ching umbrellas that became a central prop towards my work that became a central focus and culminating act – sewing of white cloth against ‘Corruption’ stamped on his umbrella. 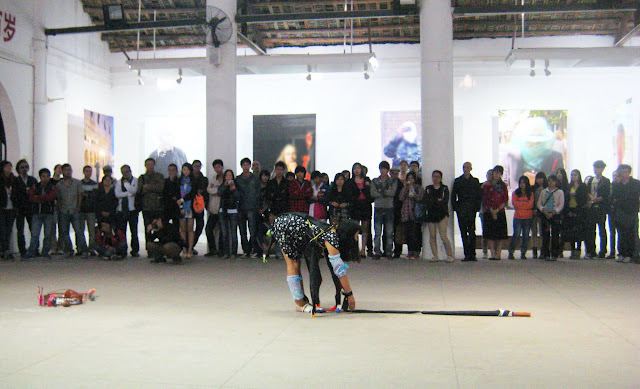 , as well as materials that I had collected throughout my journey across China (scrap materials, images and audio recordings of traditional songs, soundscapes from parks etc) in harmony to my performance to enhance audience connection to my work, the site, the specific festival and some of the artists also participating. Military Craft was extended into an exhibition at Sabaki Space, ‘Trading Places’. I talk to Johanes Deimling and Marcel Sparmaan on their experience of ‘Military Craft’ and the realm of interaction, Johannes for instance chooses not to interact with the audience in his performances. This version : 2 mins from full performance of 21 mins 43 secs. Click here to see Military Craft II exhibiiton details, performed at Golden Thread Gallery, as part of Imagined Communities, Curated by Miguel Amado.